The showdown in the judiciary following the detention of one prosecutor by another prosecutor has now sparked heated accusations and dramatic claims of political meddling and illegal intervention -- the stuff from which Turkish political crises are made. Turkish judicial institutions have long been criticized as politicized, susceptible to being used as supposedly legal means to the political ends of the players and motivations that constitute the country's political theater. The last major political crisis here ended in a very narrow decision by the Constitutional Court not to close the ruling political party, which portrays itself, and to large extent is, opposed to the traditional, "secularist" elite. Though the reality is more complicated, or at least more multi-faceted (with more players), the religiously conservative AKP/"secularist" elite face-off fits the judicial sparring that resulted in the closure case of 2008, and might well result in another. The 2008 political drama ended in a denoument disappointing to Turks who want to see political institutions reformed so that future crises may be diverted. After having survived the Constitutional Court decision, the AKP did little to change the rules regarding the closure of political parties, shelved plans for a new constitution, and attempted to make new friends by adopting a nationalist tone that turned off reformers, as well as those who have long been marginalized by Turkish state policies. I asked at the conclusion of the closure case if salvation could bring redemption (see Aug. 1, 2008 post), and the verdict is still out. No doubt dealt a difficult hand after the closure case and having just saved its head from the Court's guillotine, the AKP's inaction might be understandable, its attempts to make new friends -- if thats what the increased nationalism was about -- excused. Plus, the opposition CHP had vowed to oppose even the slightest constitutional change at the same time the Constitutional Court gave itself unprecedented authority to exert judicial review over constitutional amendments -- according to Ergun Ozbudun, "[t]he translation of the court's decision is that a new constitution could only be the product of interruptions such as coups d'etat or civil wars and that is against all logic." However, understood/excused or not, the dragging of feet might well result in a gnashing of teeth should the AKP find themselves subject to another closure case. Having still few friends at high levels in the judiciary, and perhaps more enemies as a result of the Ergenekon investigation (the questionable handling of which has done little to win over many reformers or friends in Europe), it seems Turkish political observers need to start gearing up for another drama. - “If this is the case, no one can expect us to surrender to the Constitutional Court’s guillotine, so to speak. We go to people and explain the situation. We seek our rights in the people’s court. In case of a possible closure case, we’ll go to elections immediately. - “It is accurate that our Prime Minister has already announced that there wouldn’t be an early election in 2010, but the latest developments make the situation different because a possible closure decision allows us to more or less guess who could be banned [from politics]. We cannot accept this. - “Besides, we’ve seen previously: The Feb. 28 process helped us, we came to power in 2002. The Apr. 27 military e-memorandum and the Constitutional Courts 367-quorum blows also helped us increase our votes. People do not say anything about these plots but upon having the power they use it to their best. A possible case against the AKP would not divide up the party, as some expect, but reinforce us, to the contrary. While the HSYK and judges from the Council of State and Court of Cassation are decrying denunciations of their decision by Justice Minister Sadullah Ergin and Deputy Prime Minister Bulent Arinc, Ergin and Arinc, for their parts, are declaring the HSYK to have "revealed their true colors," citing the need for judicial reform and an end to judicial/military tutelage. The CHP, as is to be expected, is backing the judiciary, accusing AKP "cronies" in the judiciary as acting like "hitmen." Hurriyet revelead more details about Cihaner on Thursday, pointing to past cases he brought against individuals linked to groups the state is now claiming to be involved in the broader Ergenekon network. The article also reiterates slams exchanged between the government and the judiciary. Today's Zaman columnist Yavuz Baydar gives the background of relations between the two prosecutors at the heart of the imbroglio, repeating suspicions expressed that Cihaner might have been working with the military to coverup Ergenekon-related activity by passing blame onto the Islamic brotherhood Cihaner was investigating (for more on these accusations, see Gen. Saldiray Berk's case, who faces becoming the first uniformed general to testify in the Ergenekon investigation). Fellow Today's Zaman columnist Nicole Pope writes that "[w]ith this latest escalation, it has become painfully obvious that no common language or common vision for Turkey’s future remains, if it ever existed." Pope reflects on the institutional flaws at play, decreeing Turkey's voters to be the ulimate referees of the struggle for power while pointing to opportunities the AKP missed to push for institutional reform in the past. Pope also observes the removal of prosecutors in Erzincan to not be without precedent: in 2007, a prosecutor investigating the Semdinli bombing, thought to the work of military-linked agitators now attributed by some to also be part of the Ergenekon group, was stripped of his power after exploring possible connections between two gendarmerie officers and a PKK-informant to officials higher-up.For a decent summary of the entire affair as it stands now, see Thomas Siebert's reporting in The National. The institutional weaknesses of the HSYK manifested themselves last summer in a dispute centered on appointment of prosecutors and the Ergenekon investigation. While judicial handling of the Ergenekon investigation has come under fire for being slipshod and driven by politics (for example, see Gareth Jenkins), the HSYK's threats presaged the confrontation now occurring. Now that the AKP is facing a looming closure threat, time will tell just how it will approach the constitutional reform package it is preparing and just how opposition parties will respond. It is likely that the crisis will only heighten the degree of hostility between the parties, but perhaps it might also embolden the AKP to aggressively pursue the broad-based reforms the party has long promised, including its judicial reform strategy (approved in August), which the EU welcomed in its 2009 Progress Report. The EU, and more importantly, Turkish citizens, have long complained about Turkish political institutions only feeding the constant infighting and political theatre to which Turks have long been subject. Former EU Enlargment Commissioner Olli Rehn has before emphasized the need to "break the cycle" wrought by weak institutions and embroiled politicians. Because politicians do not focus on reform, too often they find themselves constantly repeating play acts remarkably similar to one another, making for rather bad dinner theater. Perhaps the time has come to close the curtains. I have heard several times that when candidates are chosen to be future judges, they are told they should keep their distance from ordinary people. They are asked not go to places everybody goes -- they should not carry shopping bags, and they should not bargain when they buy apples. Of course, not only are they learning some manners, they are taught that they are the defenders of the republic, especially secularism. I really wonder who suggested translating the “rule of law” or “la primauté du droit” into Turkish as the “supremacy of the judiciary” because it turned into a most misused term. The supremacy of the judiciary in this country is considered and implemented in a way that does not really mean the independence of the judiciary but perceives the judiciary as “above” everything in a hegemonic way. This understanding includes the dominant behavior of judges -- that of pretending they are the inhabitants of Mount Olympus. Such a great power, such an understanding, which perceives itself to be above everything, when combined with the task of being the guardians of the republic at the expense of democracy naturally brings corruption. Such corruption may not necessarily be financial but can be spiritual. The corruption can be so great as to make the judges forget that their every action should be based on the rule of law and democracy. UPDATE II (2/24) -- Istanbul Chief Prosecutor Aykut Cengiz Engin has announced that he is in receipt Cihaner's file, which he received from Sanal, who is now removed from the case. It is not clear what prosecutor will be assigned to the case. 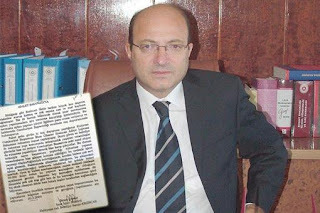 UPDATE III (3/2) -- Engin has sent Cihaner's file back to Erzurum on the grounds that it does not fall within the Istanbul Chief Prosecutor's jurisdiction. Engin is charged with overseeing the Ergenekon investigation. An indictment against Cihaner has been secured.